The NCAA baseball tournament is all set to begin this weekend, starting with the regionals at 16 campuses around the nation. After Florida won its first College World Series title in 2017, who will take center stage in this year’s tournament? Will the Gators once again rule, or will their rivals at Florida State head to Omaha? There are unpredictable underdogs, as well as the renewal of a rivalry in Austin. There’s so much to watch at this year’s tournament! While nothing is certain, as we’ve seen in years past, here are five storylines to watch during the 2018 NCAA baseball tournament. The Tigers of Tennessee Tech may not be a name we hear often, but they are coming to play. Last season they upset top-seeded Florida State, and most believe they are in that position once again this year. Playing in the Oxford, Mississippi, regional against Ole Miss, Missouri State, and Saint Louis, the Tigers will have a tough fight ahead of them. The atmosphere will be the most challenging they’ve encountered this season, but they have the stats to prove that they belong. They lead the NCAA in home runs (128), batting average (.342), and runs scored (596). They bring a great offense with star sluggers, including Kevin Strohschein (.406 BA, 18 HR), who was the Ohio Valley Conference player of the year, and Chase Chambers (76 RBI, 92 Hits). Keep an eye on these Tigers. In a few years, baseball fans young and old will be talking about Mize. Baseball America projects this junior pitcher from Auburn, whose fastball reaches the upper 90s, to be the top pick in this year’s MLB draft. 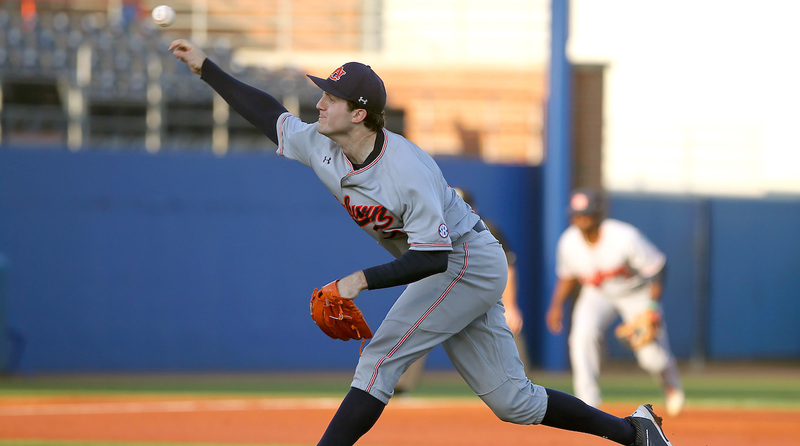 Mize has been a key part of Auburn’s pitching staff all season, throwing the first no-hitter of his college career and just the ninth in Auburn baseball history on March 9. Look for Mize to be a force against any team he faces in the tournament, starting with the Tigers’ first opponent at the Raleigh, North Carolina, regional, North Carolina State. Second-seeded Auburn will try to upset the top-seeded Wolfpack and advance to a Super Regional for the first time since 1999. This regional will feature two of the top pitchers in the country in Shane McClanahan, whose South Florida team is the No. 2 seed in this regional, and Logan Gilbert of Stetson, who was the Atlantic Sun Conference pitcher of the year. Gilbert had a 10–1 record this season with a 2.52 ERA, while McClanahan used his ability to throw heat in order to strike out 117 batters over 71.1 innings pitched. He had an average of 15 strikeouts per game! Although we can’t be sure if the two will face each other, a McClanahan-Gilbert matchup is definitely something fans should be rooting for. Remember that both schools have a history of producing solid MLB pitchers. Jacob Degrom and Corey Kluber both played for Stetson, and Dan Otero and Dave Eiland, now the Kansas City Royals’ pitching coach, came out of South Florida. It’s been 41 straight years of making the tournament and 22 College World Series appearances, but still no title for the Seminoles or head coach Mike Martin, who is in his 39th season. This year, their wait for a CWS title might be over. The Seminoles won the 2018 ACC championship in extra innings with a win over Louisville, went 9–8 against teams that are hosting regionals, and relied on the bat of Cal Raleigh (.330 BA, 150th on MLB.com 2018 prospects list) and the pitching of Drew Parrish (2.47 ERA, 5–0). That got them a No. 1 seed and the chance to host Mississippi State, Oklahoma, and Samford at their regional. Playing at home can help a team get through the first two rounds of the tournament and make it to Omaha. Is this the season the Seminoles finally break through and take home the title? The bitter rivalry between the Texas Longhorns and Texas A&M Aggies has been going on since the two schools played their first football game in 1894. Since Texas A&M left the Big 12 for the SEC in 2012, the rivalry has diminished; the teams do not play frequently. Both schools are playing in the Austin, Texas, regional, though, and both have had solid seasons. Earlier in 2018, the two teams played in College Station. The Aggies won 6–5, and there is a strong possibility that we will see the two battle it out in another close game in Austin. Will Texas get revenge over their archrivals, or will the Aggies use their experience playing in the dynamic SEC to propel them to victory?